Use our Industrial Grade Mesh Fence Safety Banners for a LONG LASTING wind resistant banner on your fence. Our PREMIUM GRADE Wind Resistant Mesh Fence Safety Banners are made from Premium, Top Grade Nylon Reinforced Mesh Vinyl capable of lasting 3 to 7 years outdoors. The Mesh has small holes, like a screen door, and allows some of the wind to pass through DRAMATICALLY reducing wind pressure on the banner and the fence or gate by releasing the wind THROUGH the banner. On fences and gates, in windy conditions, our Mesh Fence Safety Banners will last a lot longer than a standard vinyl banner. Wind Slits?? We do not do wind slits. Wind slits turn a good looking banner ugly and are not nearly as effective as the mesh. It takes expensive specialized equipment to print on the mesh and weld the hem line. Most small manufacturers do not have mesh fence banner capability. 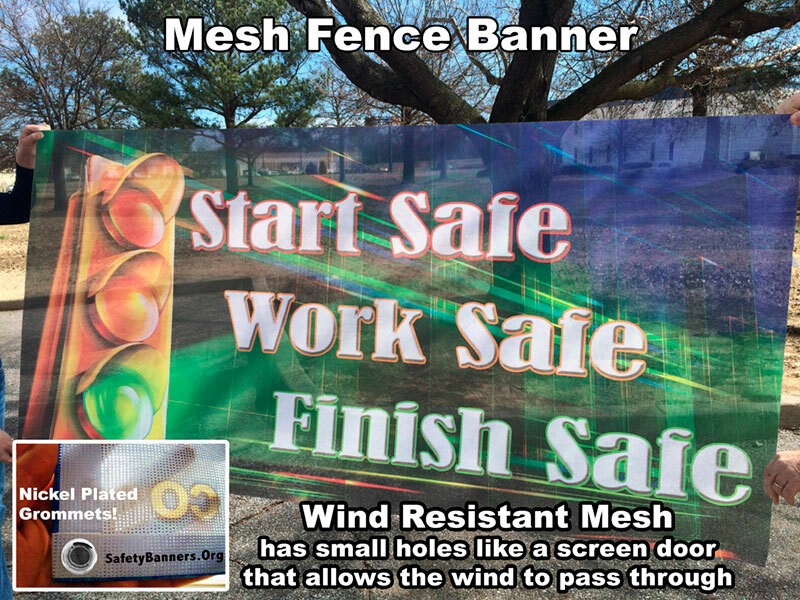 Mesh fence safety banners are also used in walk way areas where you do not want to block the person's view out, but want a graphic to display on the outside. The most common use of our wind resistant mesh fence safety banners is on a fence line or gate, where wind can put significant stress on a fence. Mesh fence banners are frequently used at large sites where both the wind and the ability to see out of the contained area are valuable. We also have clients using our mesh banners as sun screens to shade an area with the advantage of displaying a safety message on the outside. Some of our clients are putting our mesh banners up on their buildings. In fact, we are one of the largest Mesh Fence Banner manufacturers in the USA. As you can see to your right, there are holes in the mesh, similar to a screen door, so the wind can pass through. However, light from the back side will also pass through causing the printed image to be slightly less vibrant than a solid vinyl banner (where no light can pass through). Where possible, placing the banner in an area with a dark background and limited direct sun light from behind is recommended to reduce the background light shining through. HOWEVER, the mesh fence banner will last considerably longer on a fence than a standard solid vinyl banner and that is what a mesh fence banner is designed to do. 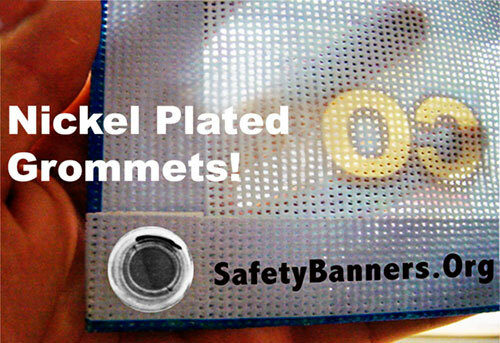 REMEMBER - We use ONLY NICKEL PLATED Grommets for a quality banner look forever. They will NOT tarnish like cheaper brass grommets. Mesh fence banners are also used on ball fields, construction sites and recreation areas. If you have a need that is not safety related, call us at 901-759-0932 to discuss your project. We also do mesh fence banners that are not safety related. Need Help?? Call us --- 901-759-0932 --- SafetyBanners.Org, manufacturers of High Impact Safety Mesh Banners and safety products to Promote On The Job Safety. All images and designs are the property of New Tech Graphics and may not be reproduced without written permission. Manufactured on demand by SafetyBanners.Org - located in MEMPHIS, Tennessee, the Heart & Soul of Rock & Roll.